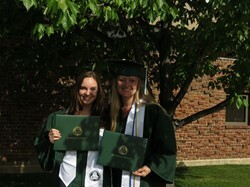 Here are two 2013 GMU Alumni who graduated from Binghamton University on Saturday. Mackenzie Burnside is working for Morgan Stanley in the DC/Baltimore area, and Jenn Mason will be attending Boston College Law school in August. Students, aim high! Big fish in a small pool can become bigger fish in the ocean with the right inspiration!